After making a live appearance yesterday and earlier today, the unannounced Nokia Normandy showed up yet again. This time around, the low-cost Android smartphone revealed its color range on Twitter, courtesy of @evleaks. 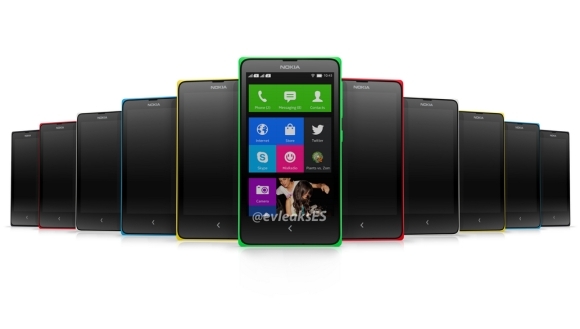 The leaked press image reveals the smartphone in six different colors – white, black, red, yellow, green, and cyan. They fall right in line with those of the budget-friendly Nokia Asha 503. Furthermore, the press image showcases the homescreen of the Nokia Normandy, where Nokia MixRadio and dual-SIM functionality capture the attention. Curiously, with various apps on it, the homescreen resembles a lot the Windows Phone UI of the Nokia Lumia range. Rumored specs for the Nokia Normandy include Qualcomm Snapdragon 200 SoC, 4” FWVGA display, 5MP camera, and Android 4.4.1 KitKat. The smartphone is tipped for a launch during MWC 2014 next month in Barcelona. How about an ASHA OS with Android app compatability like Jolla Sailfish OS? Sounds nice right.